Chitwan National Park in Nepal is one of the favorite park in Asia. Chitwan National Park of Nepal is one of the most visited parks in Asia. This park has been granted status of World Heritage Site. This Park in central south Nepal offers you varieties of interesting sightseeing program. Chitwan is rich in forest and animal inhabitants. Most travelers and nature lover visit this place for relaxation. It has swampland, Crocodile, one horn Rhino, multitude of Deer, Peacock, Boars, Red Junglefowls, snakes and numerous other animals. It is home to tribal village, dense forest and long sand beaches. The majestic Tiger, the almost unnoticeable, the one horned Rhino of the swampy grasslands are some of the attractions here. Apart from the already mentioned inhabitants, Chitwan also offers Leopards, Monkeys, Wild Boar, Gaur, Elephants and Gharials. Storks, Geese, Kingfishers, Ducks, Pitas, and Owls are here and Park is the home to birds. At the foot of the Himalayas, Chitwan is one of the few remaining undisturbed vestiges of the ‘Terai’ region, which formerly extended over the foothills of India and Nepal. It has a particularly rich flora and fauna. One of the last populations of single-horned Asiatic rhinoceros’ lives in the park, which is also one of the last refuges of the Bengal tiger. Park is one of the premier drawcards in Nepal. This World Heritage–listed reserve protects more than 932 sq. km of forests, marshland and grassland containing sizeable animal populations, making it one of the best national parks for viewing wildlife in Asia. You’ll have an excellent chance of spotting one-horned rhinos, deer, monkeys and some of the more than 500 species of birds. If you’re extremely lucky, you may spot a leopard, wild elephant or sloth bear – though it’s the once-in-a-lifetime chance to spot a majestic royal Bengal tiger which is the premier attraction. 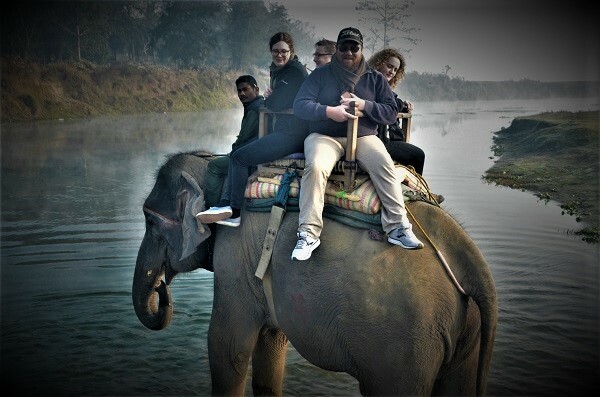 Sauraha of Chitwans offers you Atms, hotels, countless services, cultural dance, elephant breeding centers, free Wi-Fi, hot shower, swim, pick up and drop if you do not do the package order at the time of booking. Day 1, Reach Sauraha, freshen up, snacks or rest. River side sunset view, Tharu stick dance, Dinner and rest. Day 2, Wakeup call and head to boating and Jungle safari walking or Elephant safari. Morning is the best to view the Jungle. Return and breakfast, rest and lunch and departure or stay further. Canoe ride & visit to Elephant breeding center. Elephant safari and Dinner. Stay in good hotel in town which has hot and cold shower, with air condition room. Accessible to Wi-Fi, noise free rooms, TV, and call service. Single room and Double room. The Royal Chitwan National Park is a very popular tourist destination in Nepal. Visitors have the option to enter the park from the eastern town of Sauraha or the western village of Meghauli. Sauraha is the most popular entrance and is where most of the package tours go. 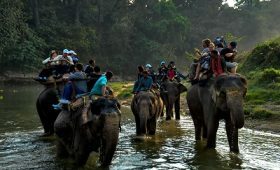 It has more than 150 hotels for all budgets, dozens of restaurants and bars and many tour agencies offering jungle treks and elephant safaris. Meghauli Village is a small Tharu settlement as a “village tourism destination”. Here there are luxury jungle resorts and all the infrastructure to run the same jungle activities than in Sauraha, but in a much more intimate environment and with the plus of offering a real Nepalese village experience. But here there are no ATMs, internet cafes or souvenir shops, and just a handful of local restaurants. The Royal Chitwan National Park is home to a very rich flora and fauna. The park is world renown for being one of the last refuges of the one horn rhino and home to other fascinating species like royal Bengal tigers, leopards, Asiatic elephants, wild boars, sloth bears, the endanger gharial crocodiles, monkeys, 5 types of deer and more than 600 species of birds. Being on the plain terrains of Nepal, the weather here is much warmer than in the rest of the country. From November to February (winter time) the nights and mornings can be cold (around 10 degrees), but the temperature during the day is very pleasant. From March to June is very hot and humid, specially from 10am until 4 pm. From July to September is monsoon season and the heavy rain can make the jungle and roads very muddy and full of leaches.